This photo was about a 3x5 photo glued to a piece of corrugated cardboard. It was in a binder with 8x10 pics labeled as all SN pics. To my untrained eyes it looked like your typical SN locomotive. Thanks for the detailed info. 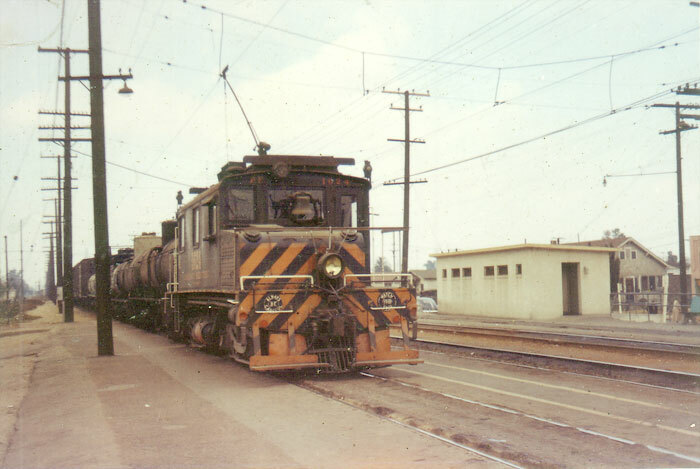 This is Pacific Electric motor 1624 at Watts, California. This location is on PE's Southern District famed Four Track's. Motor 1624 and train are moving outbound (PE's term for trains moving away from Los Angeles) on the Outbound Local track. The next three tracks are the outbound then inbound mains with the Inbound Local at the far right. Looks like PACIFIC ELECTRIC in Los Angeles. Likely on the 4-track main line that ran from LA to Watts.